Mobile and BYOD usage quickly escalated at Ceragon Networks. They realized that mobile device management was not a complete mobile security solution and could not actively identify threats and attempt to proactively stop them before real damage was done. In order to secure their enterprise’s mobile security, Ceragon Networks needed a more complete and active mobile security solution to enforce their policies on any BYOD or company devices. 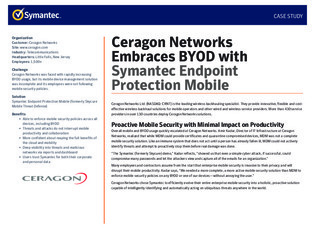 Ceragon Networks deployed Symantec Endpoint Protection Mobile and saw many benefits, including the ability to enforce mobile security policies across all devices. Download this case study to learn more about Ceragon Network’s experience with Symantec.